Unless you happen to be marrying an A-lister or footballer, the chances are, those stunning wedding dresses from equally A-list designers such as Vera Wang, Monique Lhuillier and Marchesa are likely to be a little out of reach with price tags that start at around £5000 or more. Brides have been investing heavily to secure the fairytale dress of their dreams for years and these days, even mid-range dresses can cost anywhere from £1500-£4000. Fortunately, many of our most favourite High Street stores have noticed the gaping hole in the market and created their very own bridal ranges. Here is the Woodhall Manor guide to the very best wedding dresses available on the High Street. Phase Eight are known for their gorgeous yet affordable occasion dresses and they have now taken their skills and applied them to a range of beautiful wedding dresses. From vintage inspired 50s short styles to stunning full-length gowns embellished with delicate beadwork, there are some truly beautiful dresses on offer. Available online, in Phase Eight stores and through large department stores such as John Lewis, prices range from £250-£595 with dresses available in sizes 6-20. Our favourite this season is the beautifully embellished ‘Hope’ dress that has a very 20s feel to it with its delicate sheer top and elegant silhouette. The go to place for High Street fashionistas, Topshop was always going to be at the cutting edge of accessible bridalwear. This season, they’ve launched a limited edition range of dresses in white and blush pink with strapless, tie-shoulder and Bardot styles. Priced from £350-£795 these are contemporary choices for fashion-forward brides. Also available from Topshop is the Hope & Ivy range of dresses that start at just £140. For brides happier to blow the budget on the mother of all parties instead of a single outfit, this could just be the answer. Which do we love? 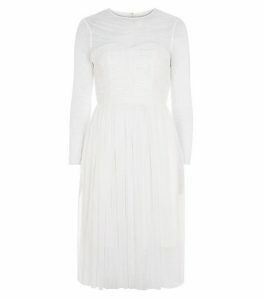 The gorgeous Topshop tulle midi dress priced at £425. 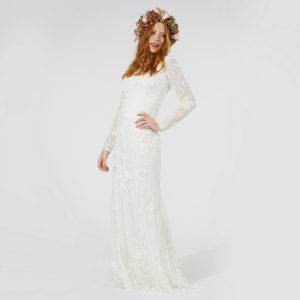 With full length, white traditional wedding dresses starting at just £220, Debenhams offers a wide range of styles from a number of designers that represent great value for money. We’re super impressed by the Ben de Lisi range that includes some gorgeous gowns that bear more than a passing resemblance to designer gowns at five times the price! If you’re looking for something a little different, the debut bridal range from Savannah Miller is available exclusively at Debenhams, and would suit a boho bride looking for a beautiful, yet practical gown. 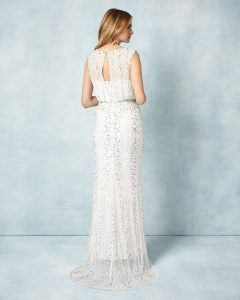 This is the first wedding dress collection from Savannah who is the slightly less famous older sister of Sienna Miller. This is a serious case of bagging a designer dress without the designer price tag. For us, the Eligenza lace dress that’s currently on sale at £336 is a complete steal! Online favourite ASOS has an amazing range of wedding dresses that are perfect for destination weddings, low-key ceremonies on the beach, or chic country celebrations. Prices start at an amazingly affordable £65 so we think that buying a second dress to change into for your evening reception is a complete no brainer! If you’re looking to turn heads with a dramatic sweep down the aisle, we recommend the trumpet hem maxi dress at £200. If you’d like to find outfits for flower girls, bridesmaids, and the bride all in one place, then you should check out the ranges in Monsoon this season. There are 22 stunning dresses all designed here in the UK by Monsoon. They showcase romantic lace and beautiful beadwork and come in midi, maxi and full-length styles. You can also buy veils, jewellery, hair accessories and shoes for you and your maids. Prices range from £229-£499 and dresses are available both in store and online. Unlike some stores, there’s no need to even book an appointment to try these on so pop in and see if anything catches your eye! We love the Veronika embellished dress for its sleek, sophisticated crossover design and a tempting price tag of £249. At Woodhall Manor we like to think of ourselves as wedding experts and would love to guide and advise you on every aspect of your big day. Why not give our totally talented wedding planners a call today on 01394 411288 or email info@woodhallmanor.com to book a private tour of our stunning country Manor house?